Thank you, Sarah for including me. and teaching has always been apparent in everything she touches. and I can’t wait to add her newest, self published title, Quilting From Little Things. You may wonder about the name of the book….Quilting From Little Things. to make a larger version with your new skill set. This quilt is my current obsession. Feathered stars have always been on my to do list. I had a piece of paper hanging on the wall behind my sewing machine with all of my UFO’s. On the top of the page, I had written, TO DO LIST. Sometime, I am not quite sure when, my husband had added the words… in this lifetime. Do you have a to do list of quilts you want to make that is longer than any one lifetime? This quilt has moved up my perpetual quilt…to do list. because this is the quilt I am going to make. One more comment about Sarah and the quilts in this book. (after all she is from Australia) to the combination of scale, color and design. Ask for this book at your favorite independent quilt retailer. If you are just joining the blog tour, please visit my fellow bloggers that have posted earlier in the week. 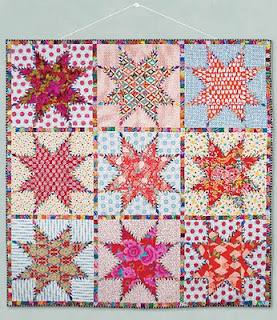 That star quilt has been on my to do list too. I have ordered the book and am anxiously awaiting its delivery. I can't wait to try these small blocks out and who knows, maybe make a big version. Thanks for the blog hop. It's a great way to find great new books. Had to laugh I have a list like that AND I keep adding to it! I love this book, have always admired Sarah's work. that quilt would be beautiful in Christmas fabrics just as the quilt on page 75! my 'to do list' is Infamous! in 2012 I'm hosting an entire year of 'Finish It Up' FIU for short.. so that we can enjoy those items on those lists we have.. and I got all my projects out.. counted them.. listed.. sorted.. culled.. already for 2012! Gotta make me at least one Feathered Star Block in 201. I need this Book!